영화 감독에 관해서는 루키노 비스콘티 문서를 보십시오. 루키노 비스콘티(Luchino Visconti, 1287년 또는 1292년 – 1349년 1월 24일) 1339년부터 1349년까지의 밀라노의 군주이다. 그는 또한 콘도티에로이자  파비아의 군주이기도 했다. 1315년부터 파비아의 통치자로 있다가 5년뒤인 비제바노의 포데스타가 되었으며, 그곳에서 그는 오늘날까지도 볼 수 있는 성을 세웠다. 1323년에 그의 가문원들과 함께 이단 혐의로 파문되었다. 이담 혐의와 파문은 나중에 풀려나게 되었고 1341년에 교황의 대리인이 되었다. 그는 1339년에 그의 조카인 아초네가 사망할때까지 아초네, 형제인 조반니와 함께 셋이서 밀라노를 공동 통치했다. 그는 또한 밀라노를 차지하기 위해 용병들을 준비한 또다른 조카인 로드리시오 비스콘티에 맞서 파라비아고 전투에서 승리를 거뒀다. 그는 형제인 스테파노 비스콘티의 아들들에게 맡겼던 북유럽 출신의 용병들을 가지고 피사를 점령하고 오비초 3세 데스테에게 파르마를 사들이며 공국의 영토를 늘렸다. 루키노는 문학과 음악의 후원자이기도 하였고, 페트라르카를 밀라노로 초청하기도 했다. 그는 세 차례 혼인했는데, 첫 번째는 톰마소 1세 디 살루초의 딸 비올란테, 두 번째는 오비초 스피놀라의 딸 카테리나와 하였으며, 1349년에 루키노에게 유일한 적자인 루키노 노벨로를 낳아준 교황 하드리아노 5세의 조카 이사벨라 피에스키에게 세 번째 장가를 갔으며, 다른 비스콘티 가 출신들은 그의 노벨로의 혈통을 두고 분쟁을 일으켰다. 그는 유능한 군사 지휘관이자 영주였지만 또한 그의 잔혹한 행위로도 유명했다. 1349년 1월에 그는 이사벨라의 외도 행위를 발견하였고 그녀에게 끔직한 처벌을 알렸다. 며칠 뒤 그녀는 독살된채로 발견됐고, 사람들은 그의 아내를 이사벨라 델 벨레노(Isabella del veleno, 독살된 이사벨라)라고 칭했다. 그는 조카들인 베르나보, 갈레아초, 1346년부터 추방당한 마테오 2세에게 자리를 물려주었다. 이사벨라의 부정 행위는 그와 그의 친척들로금 루키노 노벨로에게서 유산으로부터 멀어지게 하였다. ↑ Tolfo, Maria Grazia; Colussi, Paolo (2006년 2월 7일). “Storia di Milano ::: I Visconti:” [History of Milan::: The Visconti]. 《Storia di Milano》 (이탈리아어). Milano: Storiadimilano. 2010년 8월 25일에 확인함. ↑ 가 나 Società Storica Lombarda, 편집. (1907). 〈Bianca of Savoia e le sue nozze con Galeazzo II Visconti〉 [Bianca of Savoy and her wedding with Galeazzo II Visconti]. 《Archivio Storico Lombardo》 [Lombard Historical Archive]. Series 4 (이탈리아어). Vol. 7. Milano: Sede Libreria della Società Fratelli Bocca. 23, 27, 30, 33,쪽. OCLC 288710340. 2010년 9월 11일에 확인함. ↑ Pullan, Brian S. (1972). 〈The Coming of the Signori〉. 《A history of early Renaissance Italy: From the mid-thirteenth to the mid-fifteenth century.》. New York: St. Martin's Press. 160쪽. OCLC 613989155. ↑ 가 나 Chisholm, Hugh, 편집. (1911). 〈Visconti〉. 《브리태니커 백과사전》 28 11판. 캠브리지 대학교 출판부. 128쪽. 2010년 9월 2일에 확인함. "LUCCHINO made peace with the church in 1341, bought Parma from Obizzo d'Este and made Pisa dependent on Milan. 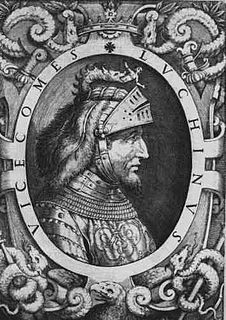 Although he showed ability as general and governor, he was jealous and cruel, and was poisoned in 1349 by his wife Isabel Fieschi"
↑ Gallo, F. Alberto (1985). 〈14 The courts of Lombardy〉. 《Music of the Middle Ages II》. Cambridge: Cambridge University Press. 59쪽. ISBN 978-0-521-28483-7. OCLC 12516508. 2010년 9월 13일에 확인함. ↑ Società Storica Lombarda (1874). 〈Società Storica Lombarda〉 [Petrarch]. Brigola, Gaetano. 《Archivio storico lombardo giornale della Società Storica Lombarda》 [Historical journal of Lombard Lombard Historical Society] (이탈리아어). Vol. 1. Milano: Società Storica Lombarda. 386쪽. OCLC 445904008. 2010년 9월 13일에 확인함. ↑ Williams, George L. (1998). 〈Two: The Papal Families at the Close of the Middle Ages, 1200-1471〉. 《Papal genealogy: The families and descendants of the popes》. Jefferson, NC: McFarland. 34쪽. ISBN 978-0-7864-0315-8. OCLC 301275208. 2010년 9월 2일에 확인함. 이 문서는 2018년 4월 29일 (일) 10:03에 마지막으로 편집되었습니다.